WoodEzine wishes to thank the great people at Kay Industries for their help with the following article. Please note that it was first published in 2004, so you might want to visit Kay online after reading it. If you've ever attended an auction where a cabinet shop or furniture factory was selling off machinery, you know how many professional machines run on three-phase power. Virtually every sizeable dust collector, jointer, table saw and molder requires 3-phase, and the sad fact is that most of us have our shops in residential areas: the local power company isn't set up to supply us with juice for these bigger, better, more accurate, more durable toys. 3-phase is the most reliable, least expensive way to run large machines. But if you want to turn big vessels or sand cabinet doors in your home workshop, you're stuck, right? Or are you? There are several manufacturers out there who make machines which will turn ordinary household current into 3-phase electricity. We contacted the biggest one we could find, Kay Industries in Indiana, and asked them how the converters work, what options are available, and how much one would need to invest to be able to have an 18" jointer humming away in the workshop. The answers here are geared to the North American market. For folks in the U.K., a visit to isoMatic UK might be a good idea. The first thing we learned about phase converters is that there are a myriad options when it comes to size. If you only have a single machine to run - say a 12" table saw or a 60" lathe - you might only need the baby of the family, a static phase converter. Kay's Miniphase units (shown at right) are sized from 0.25 to 10 HP and operate on 208-240 volt single-phase at 50 or 60 Hz (which is what most of us have in our homes to run electric stoves, water heaters and air conditioners). They're also ideal if you have two machines and only run one at a time: talk to your electrician about installing switching which will allow you to do this. Note that these converters will not operate a 460 volt motor. For a detailed data sheet on these units, click here. According to the folks at Kay, Static 3-phase converters "do not produce true 3-phase power. In fact, static phase converters are little more than electric rope starters. Unlike a rotary phase converter, static phase converters cannot balance the load between the three legs after the motor has started. As a result, static 3-phase converters never allow your motor to develop full horsepower. Static phase converters are thus suited only for small-horsepower, single-motor applications. In addtion, they cannot be used for heaters or rectifier loads." The bottom line is that you should only consider a static 3-phase converter if your application starts quickly. If your machine requires a long acceleration time, you'll need a rotary phase converter. It should also start infrequently (less than four times in an hour), and run at less than 70% of its nameplate horsepower. Full nameplate output for extended periods is only possible with a rotary phase converter. So, what does a guy do when he picks up a 15HP dust collection system for a song, or an 18" wide thickness planer that requires more muscle than a static phase converter can supply? The answer is a Rotary 3-phase converter, which produce true 3-phase power to run any type of load, or combination of motors. According to the company, Kay's line of Phasemaster rotary three phase converters are "the most reliable, least expensive way to run your 3-phase equipment. They will start and run any load--motors, rectifiers, heaters, and variable-frequency drives or any of these in combination. A Phasemaster rotary phase converter is engineered and built as a single, self-contained unit--not an erector set of capacitor panels, idler motors, and other components." Despite the fact that the unit comes complete, the editors at woodezine believe that any three-phase workshop installation is best handled by a certified, licensed electrician who is familiar with your local power company requirements and the community's building and electrical codes. This is some pretty powerful juice we're talking about. One slip-up might be your last. If you feel you have the skills and experience needed to wire it in, that has to be your decision. There's a very simple table on the Kay site which will tell you what size converter you'll need. Start out with a trip to the shop, pencil in hand, and record whatever information you can from the plate on your woodworking machine(s)' motor housing. After you fill in the details, you e-mail the form to the company and they'll tell you what you need. Larry Katz at Kay says that he would like to emphasize the importance of sizing the converter properly, and speaking with a sales rep who understands woodworking equipment. Before you order a unit, check out the factory's sales policy. Will you be paying shipping? From where? Is there a local or closer supplier? What's included? What isn't? What's the warranty period? What does it cover? Does the factory have a technical support team? Do they charge for helping you? You might also ask a few of the following questions, too: How noisy is this unit (got neighbors?) How large is it? Will a 10HP converter start and run a 10HP motor? What can wear out? What needs adjusting? "Whether you need to power an air compressor, a woodworking shop, or a laser, you'll find the Phasemaster¨ Type MA rotary three phase converter up to the task. 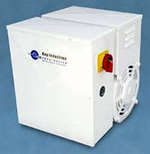 This general-purpose rotary phase converter is a reliable source of true three-phase power. When connected to a 230 volt 1-phase line, the Type MA phase converter produces 3-phase power at its output terminals with each phase shifted 120¡. You get a near replica of utility 3-phase power-more economically." After the unit arrives, there are some safety rules to follow during installation - things you might want to discuss with your electrician before he/she gets started. For example, with the Kay units you have to use a fused switch on the unit - no circuit breakers. They don't want you to bolt the unit to the floor or wall, and you should only use ring terminals (no twist connectors). For a full list of installation guidelines, visit the site. 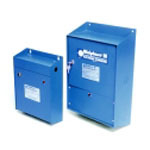 A phase converter is virtually always the most cost effective alternative to utility 3-phase. Once the loads are clearly identified, selecting and pricing the proper converter is very straightforward. The more motors that are run from a single converter, the more the converter cost per motor operated comes down. A converter is normally sized for the largest single motor to be operated. It can also run a total of 2-3 times more than it can start. As an example, a 5HP converter costing about $1,000 (in 2004) could run several motors totaling 10-15HP. Many small shops are running 37" and 43" wide-belt sanders on phase converters selling for well under $3000. The bottom line is that a small shop owner can access some dramatically more productive machinery, and the most economical way to run those big motors. If you're business is woodworking, this is an option that deserves a very serious look. And if you're a serious hobbyist who likes big toys, it's certainly a viable option.